Smart Charge: Auto Detects the connected device and charges it at the fastest speed of the device. Full Protections: 5 Layers of Protections (Circuit, Over-current, Over-charging, Over-voltage, Over-discharging) keep you and your devices be safe. Sound One Warranty: We took immense care and used advanced technology to build a worry free product. But just in case you have an issue, this product comes with six months limited manufacturer warranty and amazing customer service. 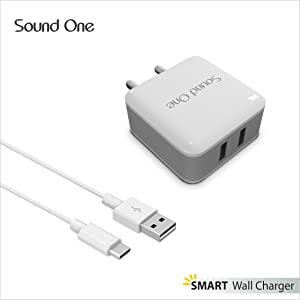 You will also get 1 meter Micro USB cable along with Sound One Smart Wall Charger. 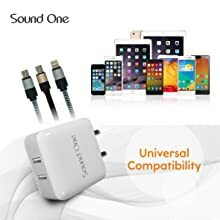 It can charge phones, tablets, power banks, kindles,external Battery Pack, Bluetooth Speaker/Headphones, Mp3 Players, and USB Powered Devices.The Sound One Charger is suitable for use with its different cables like Micro USB, lightning cable,Type C cables to charge any of the devices. 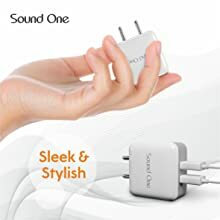 This wall charger is compatible with all mobile devices including Samsung, Apple, One Plus, Motorola, Sony, HTC, Nexus, LG,LeEco, Letv,Panasonic, Micromax, Coolpad, XOLO, Lava, Celkon, Karbonn, ZTE, Intex, Iball, Swipe,Toshiba etc. 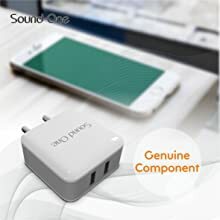 Sound one wall chargers are designed for India in accordance with Indian voltage and current standards and to provide stable output during voltage fluctuations.Advanced components provides protection against over-current, over-voltage, and multiple protection system ensure the safety of your gadgets. The micro controller detects the current requirement of the connected device in each port to charge each of the device optimally at fully intended speed up to a total of 2.4A.Smart IC charger will automatically detect the maximum current need of your device and charge the device at the maximum current. Premium internal components ensure perfect operation,even being bumped around, shoved in a handbag or dropped on the floor.Sleek and minimalist in its design, the Sound One wall charger occupies less space and easily to carry into your palm, purse and luggage. The Diamond Polished Premium White Color makes it more stylish. 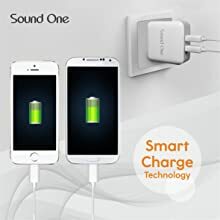 Sound One Smart wall charger comes with 1 Micro USB Cable having 1 meter long so you will be ready to charge your gadgets in no time.